In this post we’ll be seeing our review of the Red Rock Outdoor Gear Navigator Laptop Bag. Even when you are traveling, you want to make sure that your valuable item like your personal laptop is properly stored inside your bag especially when you are traveling or when you are out for an outdoor adventure. Most bags are not designed to provide storage solutions for devices. This is what makes the Red Rock Outdoor Gear Navigator Laptop Bag differ from the rest of the choices. This NAV Bag is designed to give you a storage solution where you can properly organize your personal items including your files, survival essentials and even your laptop. This bag is not just a laptop bag. Comes With A Padded Internal Sleeve Where You Secure Your Laptop But Not Only That You Can Also Store Other Items Like Gear, Accessories, Etc. You Can Also Store Straps Since It Has Zippered Back Panel. You Can Customize Your Bag With Its MOLLE Webbing And Identification Window. Is this the suitable bag that fits your needs? This product review gives you the details of its features and design so you can see if this is the bag that best fits you. Solid and Lightweight Design: What you will like about this bag is its solid design as it features MOLLE webbing all throughout. Since it is made of 600 Denier Polyester with PVC lining, you have a rugged bag that is perfectly suitable for outdoors. Unlike other bags that can be too bulky and heavy to carry around, this bag offers you convenience. Weighing just 3.4 pounds with an item size .17x.12x.12 inches, this is a get to go bag that you can carry anywhere you go. Convertible Strap System: One of the things that you will like about this backpack is that it has a convertible strap system which gives you versatility. You can change the way how you want to carry the bag depending on purpose and how you want to use it. You can use the backpack straps or even store it in a zipper sleeve. You also have the option to use just a single shoulder strap which is removable. Comfort and Ease: Comes with 2 stowable padded straps and sternum strap which makes the bag comfortable wear and giving you stability while you are on the go. The shoulder straps are contoured so this bag is comfortable to wear as it can balance out the load making it not too heavy to carry. Big Capacity: This NAV Bag has an amazing big capacity with about 15.5 Liters of total storage so you can basically bring all of the essential stuffs and other items you need. It comes with 12 compartments and dividers where you can different items from small to bulky ones. You can store even your 15’’ laptop with its internal sleeve. Flexibility: One amazing feature of this bag is that you can expand the storage of the main compartment as it comes with an expansion zipper which is pretty much the same to that of a luggage. Multiple Storage Options: Whether you want to store your accessories, electronic devices and other items, you get to have multiple storage options. It also comes with front utility compartments and key ring (quick release) so you can store your accessories and other utilities. At the same time, you won’t have any difficulty taking them out when needed. Since the pockets are placed, you can easily see where the items you need are located. For its price, built and design along with its product features, there are so many things to love about the Red Rock Outdoor Gear Navigator Laptop Bag. Using this bag, you get to have the versatility and the storage solution for the essential items that you need to bring wherever you go. 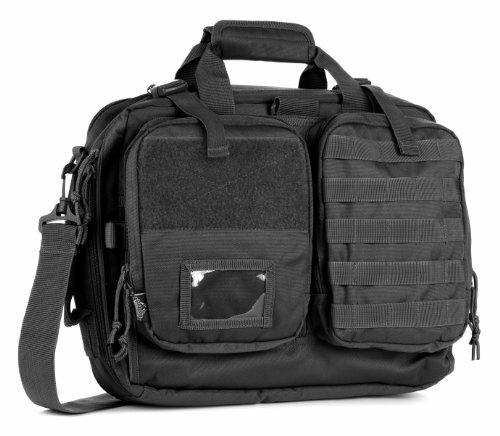 Whether you need to bring your 15’’ laptop with your, gear or any other items that you want to take along with you, the bag is has enough space to make sure that your items are organized and well-kept. It is also available in different colors so you can choose which design best suits you. Over-all, this is a multi-purpose bag that gives you the storage solutions that you need both for daily use or when you are out on a fun adventure.